Sorry - on the app, have to copy/paste to an extent!! Claim a free Intel App Pack when you buy this Intel Core laptop. 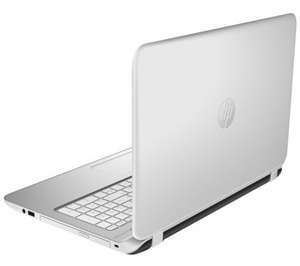 Portable, powerful and perfect for all your everyday computing, the HP Pavilion 15-p189sa is the ideal laptop for using on the move. An Intel® Core™ i5-4288U processor provides plenty of speed for all your daily and demanding computing. Whether you're browsing the web, quickly editing a photo or typing up essays and projects, you can expect fast, reliable performance that lets you work at your best. There's 8 GB of RAM to take care of multitasking, so you can work on several documents at once or download, chat and browse simultaneously without worry. A 1.5 TB hard drive provides plenty of storage for files, photos, software, media and more. Backing up is simple thanks to Windows 8.1's Cloud connectivity and USB 3.0. Cloud backup can be set to automatically upload files to secure online storage for complete peace of mind, while USB 3.0 features rapid data transfer speeds when saving to external storage such as memory sticks and hard drives. Forget the days of tinny laptop audio and enjoy music as it should be heard with Beats Audio. Whether you're listening through the stereo speakers or headphones, you can expect great quality audio thanks to Beats' graphic equaliser and dynamic preset modes. The Pavilion 15-p189sa comes pre-installed with the expressive Windows 8 operating system. Packed full of intuitive apps, it gives you the information that's important to you as soon as you need it. The Start screen is based around Live Tiles. These program icons display real time information from all your favourite apps including social networking, emails, news and sports directly on the home screen. You don't even have to open the program to receive important info and notifications. Intel®Iris™ delivers impressive graphics throughout all your everyday computing. You can edit photos, play the latest PC games and enjoy HD films at their best - all without the need for a dedicated graphics card. Whether you need to quickly tweak an image before a presentation, or have an hour to kill with your favourite game, you can be confident you're getting the best from your visual media. HP Connected Photo makes it easy to sync photos between your laptop, tablet and smartphone. Simply upload your images to instantly access them from any connected iOS, Android or Windows device. All you need is the free Connected Photo or Snapfish apps to get started. Work and play wherever you are with the portable HP Pavilion 15-p189sa 15.6" Laptop. Was looking for a 13" laptop but can anyone give their thoughts/review on this? Was looking for a 13" laptop but can anyone give their thoughts/review on … Was looking for a 13" laptop but can anyone give their thoughts/review on this? Overall the specs for this laptop are very good value. The only downside for me is that is a HP, I had a bad experience with one before and I told myself never again. HP website claims it's 2x750GB drives. This was posted several times yesterday wasn't it? Dont get it! I bought one yesterday..... it uses cheap, I.e. SLOW parts.. hdd, dvd drive, nic card only 10/100, wireless only bgn, no ac. Plus build quality err creaks!! Watch out for the useless and over sensitive mouse pad. Forget about trying to rip dvds too, my old dell inspiron 660 with i3 3320 beat this hands down!!!! My mistake for rushing out to get it without checking individual specs of parts Incuded. Mazda99....you will post that message in December 2015. So, at what point did you invent the time machine? (The laptop will not run OBS and Garrysmod. Tried it. The IRIS graphic card is another weak point).